"This is but a taste of the terror Saruman will unleash. All the more potent for he is driven mad by fear of Sauron. Ride out and meet him head on." Finding your own RP can be difficult if you don’t know where to look. There will also be several types of RP as well that are not just LARP based. Generally, checking your local gaming store is a safe bet. Either the Storytellers of the live action group will have a listing of contact numbers, or a date and location for their next game if they’re accepting members. Some LARPS also spread by word of mouth. are a couple of Web sites to get you started with the general idea. 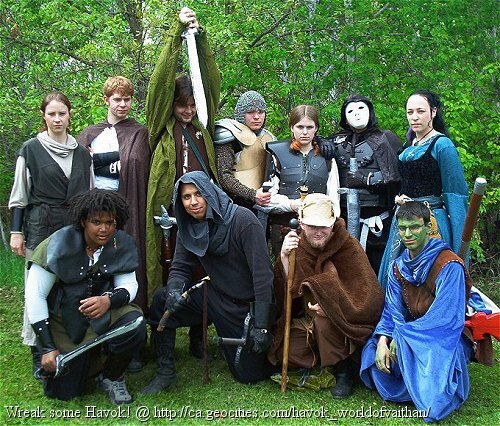 If there are no LARP troupes within your city or town, you can do one of two things: either go to another city or town close by and hope they have one, or start your own LARP. 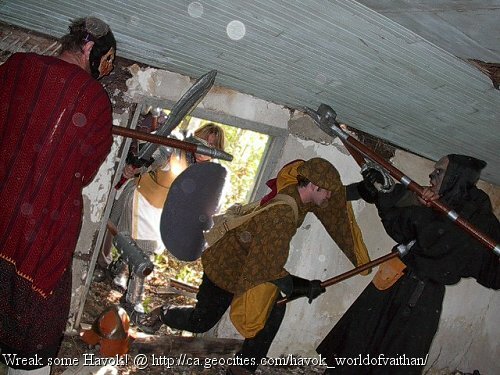 Starting your own LARP can seem intimidating when you first start. There are a few things to consider like location, weather, size of the area, size of your troup, interaction with local authorities, interaction with the public, costs and props. All of these things decide on how your game will run, where it will run and how well it will run. First and foremost, you need to decide on what type of LARP you want to run (Fantasy/ Modern/ Post-apocalyptic), what system or rules you want to use and what your storyline will be. Storylines will decide the outcome of your game ultimately, so have an interesting storyline for players to follow is always a good idea. Storylines will also challenge players not just with their characters ability, but challenge the growth of the players as well. Storylines are what allow characters to interact with one another, so that can actually lead to what is called a character driven storyline. Character driven storyline and chronicle storylines all drive your members to learn more and round out the two-dimensional aspects of their characters. Speaking of characters, the next thing you need to do is help your players create a character. Just like playing a “Sit Down” or “Table-top” game, your players will need to come up with a character concept and present you with a character sheet. Some players will have difficulty coming up with a character concept, or will stick to one type of character that they can easily play. Case in point: I usually play characters that are self-reliant and have a plethora of low-level skills and knowledge; but on occasion I have played a character that will be an expert in their chosen field of knowledge. I once played a character that was deaf and had to completely rely on others for her hearing related needs. Your job as a Storyteller is to try and encourage your players to play different character types, not only to challenge the person’s role playing ability and help them grow as a roleplayer, but to also ensure that you don’t have an overabundance of one type of character. I mean, really, do you want your player base to have loads of mage type characters, but no fighters or thieves? This is why sometimes you may need to put a player cap on certian classes or even races in a game. The next thing you’ll need is a place and time to play. Most LARPS run in the evening, so that all players have the ability to get out to a game, but some will run for a weekend, starting Friday night and ending Sunday morning. When first getting things running, hold only evening games so that players can get used to each other and the game location. With your site location, you’ll need to determine if the room is big enough, what the rules are if the space is borrowed or rented, and what you can set up for props. Generally speaking, candles are a nice way to set up ambiance in a room, though they should remain unlit because of fire hazard. Consider also fabric or cloth for tablecloths or drapes, pictures or wall ornaments that can be easily removed and seating. Encourage your players to bring in props for the setting as well, espcially if character have done something in specific to make a space their own. Players may be encouraged to bring their own drinks, though food at some sites may not be permitted. Always make sure that your players clean up after themselves–nothing worse than a messy game site! Also, be sure to tell your players that if the local authorities come around, to have the players direct them to you so that you can answer questions. The odd times I’ve come into contact with police hasn’t been because of noise complaints, trespassing violations or other sort of criminal activity, but because the police were curious as to what we were doing. Be sure that your players know that any harrassment of the authorities will not be tolerated and that they should remain respectful and compliant when the police do become involved. Nothing like a good fight practice to get players motivated. Some game sites may require a fee to rent the space, or as a storyteller you may decide to charge your players a small fee for cost and upkeep of administration. You’ll need to keep track of events, plot lines, character information, items, character sheets and experience points. This requires a lot of paperwork and game fees go a long way for printer ink, paper and other game related fees. Always let your players know in advance what you may charge for game play. Not all players will agree with this, so having an explanation for cost breakdown is always a good idea. What you charge is up to you. Some games I’ve played in will charge $10 for a week-end game, but this cost goes towards at least one or two meals for the players, or goes towards rental of the space. Now that you have all the above decided, what next? Well, to have a game, you need players. Word of mouth is always a good way to get started. Tell your friends about your game and have those friends tell their friends. Remember what I mentioned before about the local gaming store? Talk with the owner about setting up a small ad in their space to advertise your game, your contact information and the times you’ll be playing. If you have webspace, set up a small chronicle page and give people the URL. You may also need to designate narrators or assistant storytellers to help out if your player base gets too large. I’ve played in a game with 60-plus people, which required three narrators, two Assistant Storytellers and one Head Storyteller. Don’t be afraid to have your players come to you with questions, problems or feedback. The game you set up is just as much theirs as it is yours, so feed-back from them should be taken seriously. But above all, have fun! 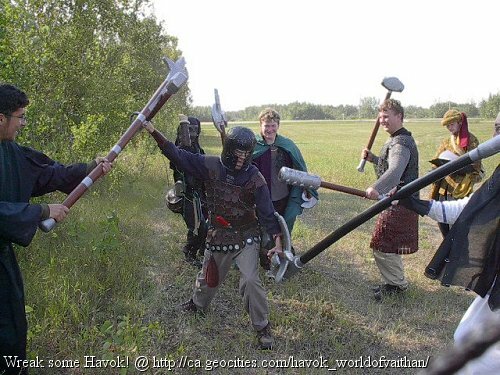 That’s what LARP is about!